Strange creatures known as "Mimics" have invaded Earth, sparking a global war that has humanity fighting for survival. In response, mankind forms the United Defense Force, a joint organization whose purpose is to overcome this new threat. Dedicated to the extermination of the growing Mimic menace, soldiers are plunged into battle, wearing special exoskeleton combat suits in an attempt to gain the upper hand against their foes. New recruit Keiji Kiriya is immediately killed after his very first deployment, but to his shock, he wakes up exactly one day before his unit was dropped into a Mimic invasion. After experiencing the same event yet again, he realizes that he is stuck in a time loop triggered by his death. As he relives the day of the battle hundreds of times, Keiji begins to make use of what he has learned about the phenomenon, gradually building up his strength and improving his skills so that eventually, when he comes face-to-face with death once more, he will be ready to change his fate. All You Need Is Kill was published in English by VIZ Media in a 2-in-1 omnibus under the Shonen Jump Advanced imprint on November 4, 2014. The English version was nominated for the 2015 Eisner Award for Best U.S. Edition of International Material Asia. It was also published in Italian by Panini Comics under the Planet Manga imprint from June 21 to September 20, 2014; in Spanish by Norma Editorial; in Polish by Japonica Polonica Fantastica in 2014; in Portuguese by Devir in 2015; in Brazilian Portuguese by Jbc in December 2014; and in Turkish by Akılçelen Kitaplar in December 2015. If you've read some of my other reviews, you know one concept that interests me is that of immortality. Time looping is another concept I find enthralling. It's almost like being immortal, except you live the same time period over and over again. In some ways, I feel this could be even worse than immortality, since usually the situation that is repeated is an unpleasant one. Before we dive into the story, I'd like to mention the artwork. It's absolutely top notch. Every panel has a painstaking amount of detail, from the character designs, to the suits, to the environments. Obata Takeshi is responsible for the designs, whom some of you may recognize as the illustrator of Death Note and Bakuman. While I haven't read either of those manga, I can only assume his work is in top form here. Aside from the time loop aspect, the story isn't that special. I won't spoil anything, but expect a typical sci-fi mecha setting. The time loop is what makes things interesting. The main character slowly learns the rules of the loop, and the reader along with him. If you have a scientific mind, the implications of each rule will leave you fantasizing for at least fifty loops. An important aspect for a time loop story (especially one where the main character remembers the loop) is how the character(s) adapt. Do they resolve to find a way out? Do they learn to accept it and endure for... well, eternity? Or do they lose their minds? There are so many ways for a character to react. Yet, the one that makes the reader's blood boil the most is when a character strengthens their resolve and soldiers onward (literally). The main character is many people's definition of "cool", and it works for this setting. Unfortunately, not all characters are created equal. The main character and main heroine get some pretty heavy development, but none of the side characters do. It's understandable considering the nature of the story. Not much can change after all. However, we never even learn much about these characters. They're just faces that pop up every once in awhile. This, for me, was probably the weakest aspect of the manga. People who don't enjoy gore should avoid this, as the artwork is very... detailed. I'd recommend this for people who like sci-fi or heart pounding action sequences. I enjoyed this manga, and it wasn't that long of a read. If you find yourself with nothing to do, this manga won't leave you asking for your time back (unless you're just selfish, then shame on you). Story - as far as story and concept goes, I think that's the weakest aspect of this manga..
Concept of the story is pretty much a continued session of 'loops' of the exact same time period happening. Some people who maybe have just started with reading manga may find it innovating, but it really isn't, as such concept was used in numerous manga series already. Story itself was a bit disappointing too - the story is based on the light novel, but the manga misses a few important details, which ruins the overall experience and may make the manga feel a bit rushed. Story gets something between 7 and 8, I had much higher expectations. Art - certainly one of the strongest aspects of the manga. I enjoyed both the style and how detailed everything was. Usually we only get detailed MC's, but in this case almost all the side characters are pretty detailed too. Art is a strong 9. Characters - characters sure do feel alive, the MC's personality realy changes a lot due to loop and the progress of that is well described. Side characters also get some personality, but they aren't realy developing, mostly because manga is stuck in 1 day probably. Relations between character felt a bit rushed though and it felt like relations of side characters to the MC were improving with loops even though they don't know about it. We shouldn't forget that MC is supposed to be a green newbie in eyes of the army and higher ups probably wouldn't ever pay attention to him. Enjoyment - I personally found it very enjoyable and entangling, I loved the concept of looping and enjoyed the development of MC's personality. The plot also isn't complex at all for such concept, as it usually is, so it should be realy enjoyable for a casual reader. Overall I think the manga was very good (8) - it felt a bit rushed at times, but the art and some twists really kept you entangled enough to enjoy this short read. It is interesting enough to read through, but don't expect anything complex, I judged it based on the fact it's an 17 chapter manga and for such length the plot was realised pretty well, but I originally hoped they would make it a bit longer, skipping less small details. Japanese light novels (novels with illustrations that normally target the young-adult demographic) are widely popular, in Japan, that is. Sadly, most of these novels are never properly translated and fans have to use fan-translations. All You Need is Kill is an exception to this ruler, even receiving a manga adaptation and Hollywood movie adaptation. All You Need is Kill is the manga adaptation of the science-fiction light novel of the same name. While the original novel was released in 2004, the manga adaptation was made one decade later, to coincide with the release of the movie adaptation, Edge of Tomorrow. While the original story was created and written by Hiroshi Sakurazaka, the manga adaptation was penned by Ryōsuke Takeuchi (ST&RS) and illustrated by Takeshi Obata, who normally works with Tsugumi Ohba and did the art of Death Note and Bakuman. All You Need is Kill takes one of my favorite ideas of science-fiction, the time-loop, and puts it in a militaristic setting. While it is not exactly a new idea, it is brilliantly approached and used. The effects of the loop are fairly evident to Keiji, who learns a bit more with each iteration, but also descends further in despair. The only "but" is that some more iterations could have been adapted to better get the impression of Keiji's slow evolution.Despite that, the pacing is fine as it is. The other protagonist, who understands the first protagonist's situation, is properly introduced and brings something new to the story. This protagonist's presence also makes this entertaining story into a more emotional one. This gives a fairly decent amount of depth to it, making it much more enjoyable than it first seems. Because of the nature of the story and its small "size", the side characters are not really explored. The relationship of the two protagonists is predictable and a bit cheesy, but not boring. The final touch of it is hugely emotional and only happens because of a fairly interesting and logical twist. The art by Takeshi Obata is pretty great and full of details, but perhaps a bit too full. It doesn't pack any punches in showing the dismembered bodies of soldiers and aliens and also captures pretty well the atmosphere of a chaotic battleground. People with weak stomachs may wish to avoid All You Need is Kill, as it is pretty visceral. I enjoyed it greatly, because of my love for time-loops, but also because All You Need is Kill was much more than it first seemed. Fans of science-fiction might want to give it a try, as well as fans of the military genre. Also, if you want an emotional story, but that also has great action, All You Need is Kill is a nice option. Now, if you dislike time-loops, you will probably hate it. If you've read some of the personal information, you know that I usually like to complete some of the author's works to fully enjoy the experience of that certain mangaka. 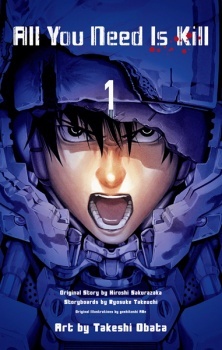 In this particular case, I will dive into one of the most famous works of Obata Takeshi: All You Need Is Kill. This little unique story uses immortality and time loops to build the setting, which is something very interesting due to the fact that, in some cases, it is very rare to find stories like this. Before I dive into the concrete story, I'd like to mention that this manga was sold in many languages and it was published very quickly, making it one of the most international mangas volumes ever made. That is something that I find unique and wonderful at the same time because proves that Japanese manga is not only sold within Japan. All You Need Is Kil (or simply AUNIK) kinda reminds me of American comics because the way the environments are expressed. The character designs and the detail are one of the best things that you will ever read and as some people will say, it is done by the same author that did Death Note, Bakuman and/or more recently Platinum End. But the story has nothing interesting beyond the loops and the immortality, in fact, this story is pretty basic, to begin with. The looping it's the main reason to read it, no spoilers for those who have not read yet but the main protagonist slowly learned how to used and the reader too, along with him. There are many ways to use it and the main protagonist chooses one of them. As for the main character, he is the definition of a "military bored soldier" and that's basically how things work from there. There are other characters which personally should have appeared more often but that's a personal opinion like the mechanic girl named Shasta Raylle or the cantina girl named Rachel Kisaragi, for example (I personally think that both Rachel and Shasta are one of the most beautiful well-designed characters that Takeshi Obata ever made so far). In response to this, not all characters are equal and that's a shame, unfortunately. However, Keiji (the main protagonist) finds Rita (the main heroine) but we never find much about this characters anyway because this has a small plot with very limited characterization and development and that's the weakest aspect of this manga. The artwork is just very detailed and overall is amazing, as usual of Obata. I'd recommend this manga for people who like very little stories, Obata works or even to try something new, just don't get your expectations too high because it will go to be not worth it. Read this manga as something new or eventually buy it, like this you will love it for sure. Personal Note: This manga took two months to be complete in Portugal and this review is based on the Portuguese edition.